A sleeping brain is powerful and purposeful. As Dr. Weisbluth says in his well-known and oft-cited book on child sleep, “a sleeping brain is powerful and purposeful.” Children who sleep well are better able to learn and process information. Since sleep is a biological need, sleep deficiency harms the brain. Sleep quality is best when it is synchronized with the child’s biological need for it. When a child gets the sleep that they need, they wake happy, are more easy-going, are better able to concentrate and are also more flexible with demands. Good sleep habits developed in childhood provide the foundation for good sleeping habits that last throughout one’s life! 15 mos. – 3.5 yrs. Newborn sleep can occur around the clock and is sporadic and unpredictable. Newborns are not mature enough to develop sleep rhythms or maintain schedules. Often they are quick to fall asleep and will sleep for 10.5-18 hours total. 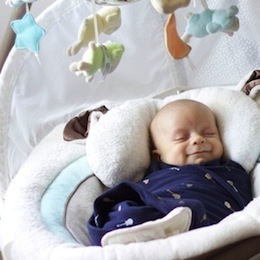 Your primary goal at this stage is to keep the baby as well rested as possible. This is a great time to closely observe your baby’s sleepy cues so that you can put your baby down before they become overtired. At this age they should be placed on their back to sleep when they are drowsy but awake. By this age babies are becoming social beings. This is the time when you will notice a more regular pattern to their sleep starting to develop. They will really start to enjoy watching things and taking in their environment. You want to watch closely for their sleepy cues as they will get tired after being awake for only an hour or sometimes less. Typically, babies at this age should be taking around 4-6 naps a day. Any day/night confusion that the baby had previously will have ended. Biological sleep rhythms now exist for your baby. But, around 4-5 months they are still developing their organized day sleep so you must be patient and consistent with their naps and night sleep. This is the perfect time to begin sleep training and focus on quality of sleep and sleep durations. When healthy habits begin at this age, they form the foundation for healthy sleep habits that will last throughout childhood. If your baby wakes at 7am then they should be taking 3 naps daily at 9am, 12pm, and 3pm. Bedtime is typically between 6-8pm. During this age range a few nap transitions take place. Usually by 8 months the child has dropped their late afternoon nap and is now napping twice a day around 9am and 1pm. Bedtime should be no more than 4 hours after the end of the last nap, usually between 6-8pm. Between 13-15 months another change in the nap schedule is about to take place. Your child is getting ready to transition to one nap a day and this nap will take place around noon. During this transition, it is important to keep an early bedtime so that your child has a chance to make up for any sleep debt they have accumulated. During this age children can be expected to take one nap in the middle of the day. The transition to one nap can occur as early as 12 months and as late as 18 months. Once the child has successfully transitioned, the nap will then start to lengthen over time. Bedtime will then follow no more than 4 hours after the end of the nap. Depending on the duration and quality of the nap, bedtime can be adjusted accordingly. Q : Is sleep really important? What does it actually do for my baby? YES- sleep is very important! I like to compare sleep to food- it is an absolutely vital part of healthy development. Sleep impacts numerous things such as cognition, mood and behavior, physical development, and immunity. Q : How much sleep does my baby need? Q : Is it true that some babies just don’t sleep? Sleep is a necessity in the same way that food is. All children and babies have a biological need for sleep. Sometimes if a baby is out of sync with his natural sleep patterns (i.e being put down for sleep outside of their biological rhythms) they will have an extremely difficult time falling asleep. Q : How come my baby doesn’t seem tired even when I know they should be? When a child or baby is kept awake past the start of their sleep wave their body releases stress hormones. These hormones actually make the child “keyed” up. They can often seem wired and full of energy, despite the fact that they are exhausted. That is why it is important to get your child to sleep before this happens. Q : Can you help us even though we co-sleep with our baby? At Best Rest Baby we foster the growth of independent sleepers. Our goal is to get your baby to self sooth and sleep on their own. Although we support all types of parenting philosophies, we find that our style and philosophy work best with families who want their children to sleep independently. Q : What does it mean when my baby wakes up from their nap after 30 minutes? Typically, this is a sign that your baby is overtired. At Best Rest Baby we employ strategies in a customized sleep plan that often times help children extend their naps to an hour or more. Q : Are there different types of sleep? Yes there are two different types of sleep, non-rapid eye movement and rapid eye movement. Non-Rapid Eye Movement (NREM) or “quiet” sleep is important because blood supply to the muscles is increased, energy is restored, tissue growth and repair occur, and important hormones are released for growth and development. Rapid Eye Movement (REM) or “active” sleep is important because our brains are active and this is when dreaming occurs. In REM our breathing and heart rates are irregular and our bodies don’t typically move very much. Q : I get home late from work and I want to see my baby, is it ok to keep them up? I understand how tough it is for working parents, and I know that bonding with your baby is very important. I tell my clients that relationships are formed whenever you spend time with your child; not just at night. I also tell them to keep in mind that it is the quality of your time together that matters most. For infants and children I recommend a consistent schedule with an early bedtime since sleep is a critical part of their development. Q : Do you believe in CIO or cry it out? No baby’s life is without tears and it is true that some babies cry more than others. Their cries can represent so many different things. Hunger, anger, exhaustion, sadness, and discomfort can be just a few reasons . Since babies cry to communicate, during sleep training there is often some crying. However, at Best Rest Baby we support the family in whatever sleep training method they are most comfortable with. Some methods involve more crying and some methods are more gradual with less crying. Either way, after consistently working with our families they often find that in a relatively short amount of time there is little to no crying at bedtime.